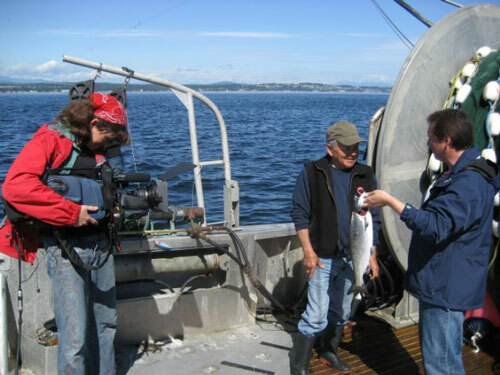 InterINDigital has produced 39 episodes (with co-production partner JoeMedia in Calgary, AB) for the Aboriginal Peoples Television Network (APTN) a series entitled 'Fish Out of Water' (FOOW), an outdoor adventure comedy/documentary series. FOOW was nominated for a Gemini award under the category Best General/Human Interest series in 2009 and won a Rosie award for Best Documentary series in 2009. Katery Legault is the executive producer, producer and one of the writers for this series. She is also the original creator of the concept for FOOW. FOOW is a 13 part, half hour, outdoor, television series that features our urban, funny, unassuming host, Don Kelly, on a demanding new adventure every week to his traditional native land and through a series of misadventures, pushes his limited limits to re-connect with his roots and spiritual values – leading to a renewed vitality and vibrancy for life. Our primary target audience is the Aboriginal viewing audience of APTN, between the ages of 18 and 50 who are seeking to be entertained and gain insight into Aboriginal traditions and be inspired by Host Don Kelly as he attempts to try some of the most important traditions and stories of the past in a contemporary context. While looking towards the future, InterINDigital strives to help preserve and promote our First Nations traditions and culture.